During the internal combustion process of an engine, there are exhaust gases which are emitted as a result of the air and fuel mixture being ignited. These are very toxic gases which could become dangerous pollutants if they were to be released into the air outside. Fortunately, cars are made with a catalytic converter which reduces the toxicity levels of these gases before they’re released out of the tailpipe. There is a special chemical reaction which allows this to happen when the metals of the converter come in contact with the gases. The downside to catalytic converters (not “Cadillac converters” as some like to say) is they get dirty. This can occur either from years of using the converter or from a problem with the internal combustion process where there is too much fuel being mixed and the extra fuel that doesn’t get burned ends up damaging the converter. 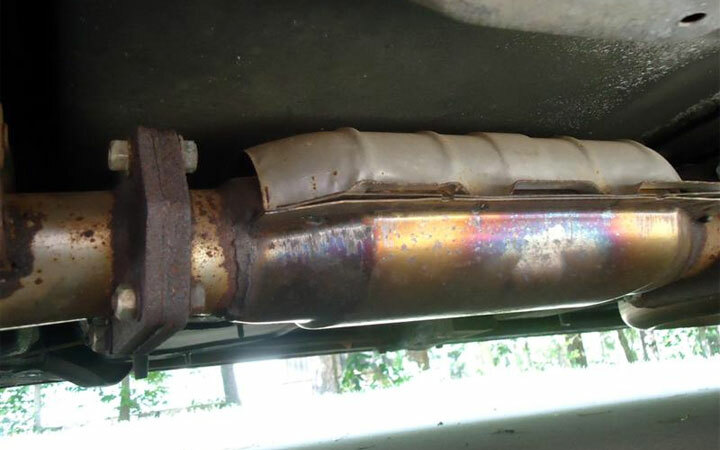 If the catalytic converter is damaged, even the best catalytic converter cleaner won’t help and replacement will be necessary. But for instances where it’s just dirty, cleaning the converter can make a huge difference. But do catalytic converter cleaners work? The answer is Yes in many instances as long as you’re dealing with just a dirty catalytic converter. If you ever notice your fuel economy decrease noticeably or a rotten egg smell is coming from your engine, then you need to clean the catalytic converter right away. There are many reputable catalytic converter cleaners available on the market. Below are the top 10 cleaners that are most often recommended. The 16 oz. 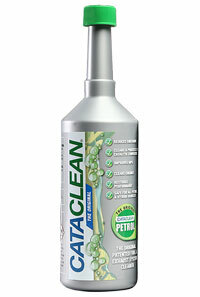 bottle of Cataclean is one of the best products you can use to clean your catalytic converter and oxygen sensors. Although it is not cheap, the cleaner has a good reputation of clearing various catalytic converter codes from your ECU. If you need to take an emissions test and you need to quickly clean your catalytic converter and fuel system, this is probably your best bet. The CRC “Guaranteed to Pass” formula actually offers a double money-back guarantee so the company stands behind their product. This solution will remove carbon from your engine, catalytic converter, and fuel injectors. It’s been used many times to successfully treat a P0420 fault code. Good to use to increase your chances of passing an upcoming smog test. Recommended to use every 3,000 miles. In addition to being a cleaner, Solder-It is designed to remove the nasty rotten egg smell from toxic gasses because of its deodorizing properties. For best results, add it to your gas tank when you have about a quarter of a tank full and drive for about 50 miles before refilling. This stuff is best for removing the rotten egg odor but also cleans your cat converter. Made in Germany, Oxicat is designed to clean the entire exhaust system by removing carbon deposits and soot throughout. When used properly (follow the directions! ), it does a great job of cleaning, restoring performance, and even clearing out check engine codes such as “catalyst system efficiency below threshold”. As with any other cleaner, it needs the catalytic converter to sustain working temperature while driving so if you cat is damaged or cracked, a cleaner won’t help you. Use Hi-Gear to clean your catalytic converter, exhaust system, fuel system, valves, and pistons. You will likely notice better fuel economy and engine performance after using. If you’re in danger of failing your emissions test, it’s worth trying and many users have reported it being able to clear out their emissions related trouble code without having to spend hundreds on a new parts. The Sledgehammer Run-Rite kit includes both a bottle of Fuel System Ultra Cleaner and the Rapid Induction Deposit (RID) cleaner to work together in cleaning your fuel and exhaust systems. This is formulated to get rid of soot and carbon which may exist in the fuel system, particularly the catalytic converter. Since you need to add the contents of RID directly into a vacuum line to release into the intake, it’s not recommended for beginners. While the popular Sea Foam treatment won’t clean your catalytic converter, it treats the problems prior to that which cause the converter to get clogged up in the first place. Many individuals have actually had fault codes related to the catalytic converter go away after using. At the very least, you’ll give your fuel injectors and combustion chamber a good cleaning. Like Sea Foam, Lucas Fuel Treatment treats the problems of a dirty fuel system which is often responsible for a dirty catalytic converter. By treating those problems, the engine will run cleaner and allow the converter to burn itself clean. More than one treatment will be necessary but you’ll be treating the root of the issue so it doesn’t occur again.